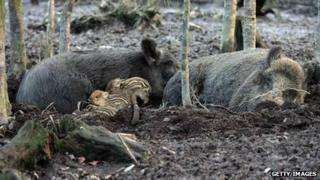 A cull of 135 wild boar will begin in the Forest of Dean next month as efforts continue to manage its numbers. The Forest Commission said a living population of 400 wild boar had been agreed as part of a three-year management plan going forward. At a meeting with the UK Wild Boar Trust, it also agreed to a voluntary closed season between the end of February and August. In recent years the estimated numbers of boar have been debated at length. Conservationists have previously argued there are far fewer boar in the Dean than the Forestry Commission believes. Currently the commission estimates the population to be 535. It has also said an annual night-vision survey will be carried out, by an independent company, to keep the estimated numbers up to date. Kevin Stannard, the Forest's deputy surveyor, said: "We are very pleased to have secured this agreement for the humane and sustainable management of the wild boar in the Forest. "We hope it will be welcomed equally by those who enjoy and those who are concerned by their presence. "We would stress once again that problems can be minimised by not feeding the boar; feeding them leads them to seek out human contact, which increases the risk of conflict with people."